The Iron Mountain campaign spelled the end of the Eastern Turk qaghanate and marked the beginning of half a century of Chinese dominance over the Mongolian steppe. 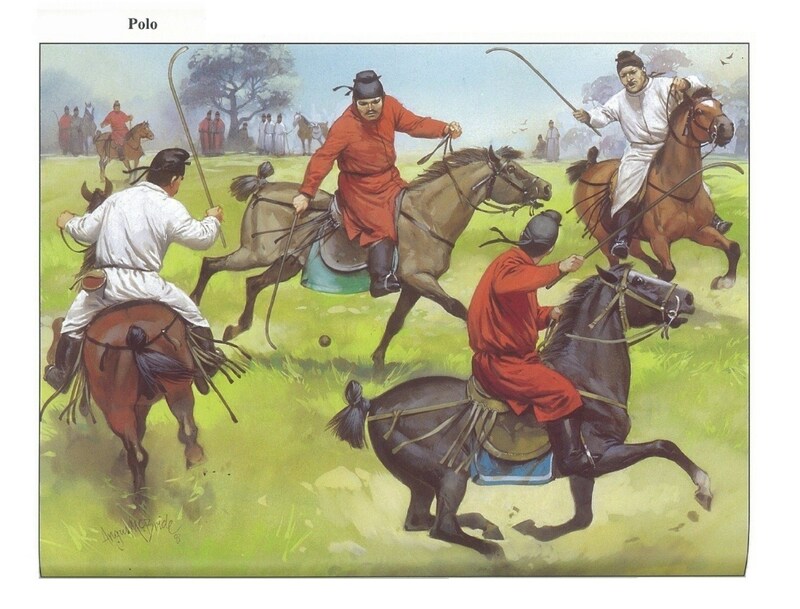 Most of the remaining Turk leaders soon surrendered to Tang, and one of them delivered the fugitive Xieli into the hands of Tang officers on May 12, 630. A few groups of Eastern Turks continued to hold out in the far northwest, but the major power north of the Gobi was now Taizong’s ally, the qaghan of the Xueyantuo. After considerable debate at the Tang court, a decision was made to settle the surrendered Turks on marginal lands along the northern border, with the majority apparently concentrated in the Ordos region south of the Yellow River bend. The surrendered Turks were treated with great care. 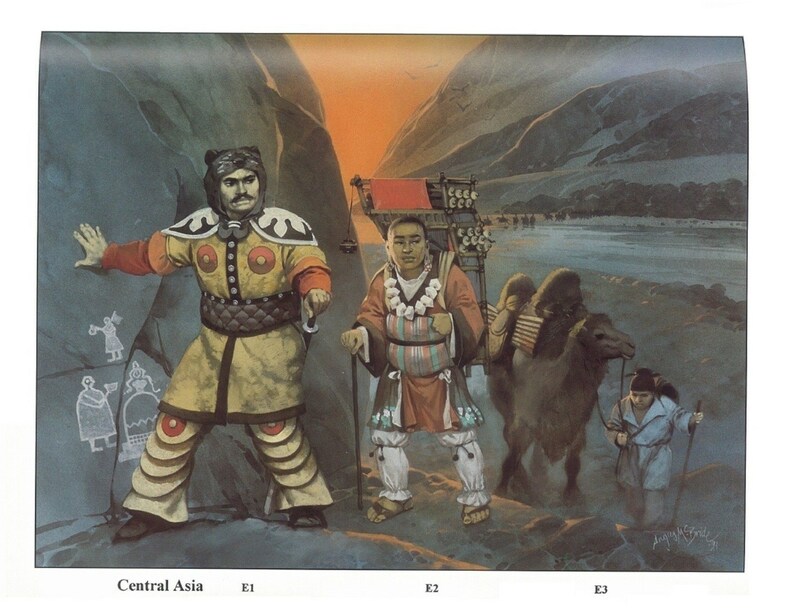 Although nominally organized into prefectures and protectorates within the Chinese administrative system, the tribesmen actually remained under the authority of their own chiefs, who received official appointments and other honors from the emperor. “Those of their chieftains and leaders who came to submit were all appointed to be generals, generals of the palace gentlemen, and other officers. 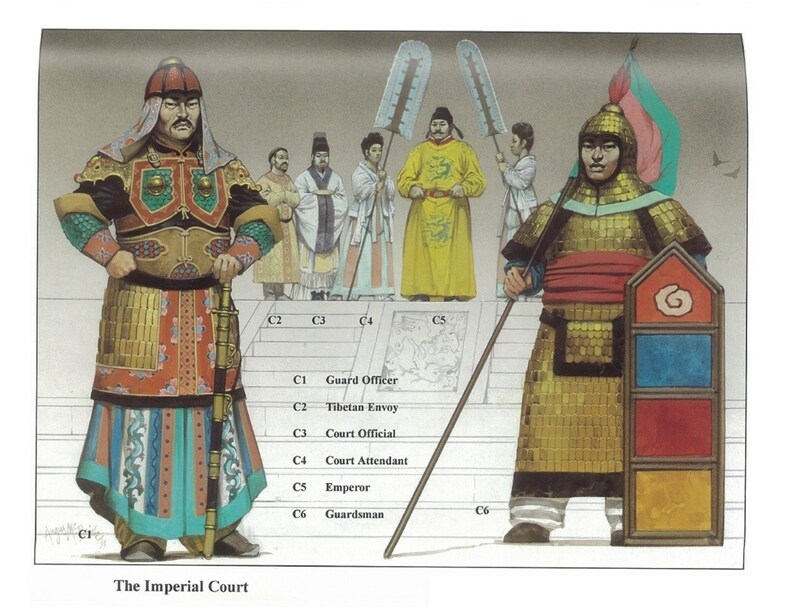 More than one hundred of them were arrayed at court as officials above the fifth rank, and as a result several thousand families of Turks came to dwell in Chang’an.” Their presence contributed to the exotic, cosmopolitan flavor of the Tang capital, which was renowned for drawing people, goods, and fashions from many parts of Asia. They also made a major contribution to the military power of Tang China. 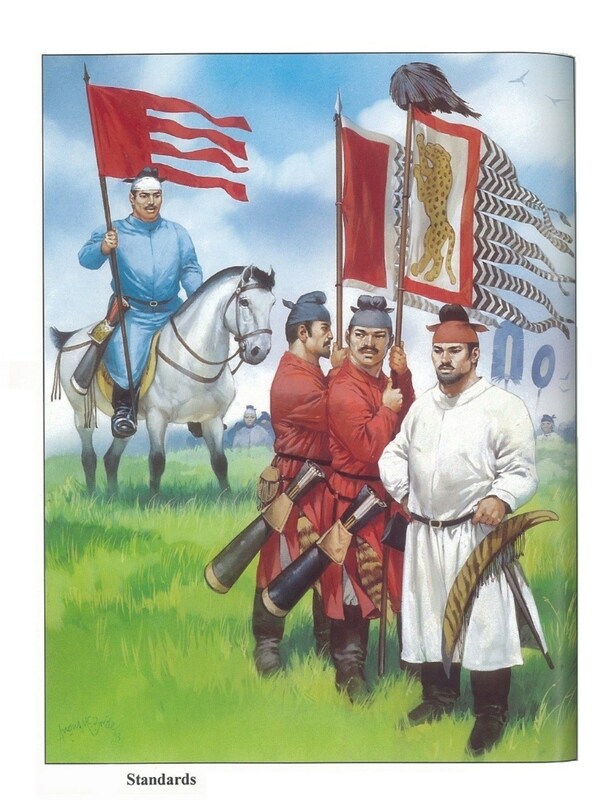 A number of the Turk leaders who had been made generals of the imperial guards later commanded Tang armies on campaign and played a major role in the subjugation of peoples farther to the north and west. The armies they commanded would include large numbers of their fellow Turks. The sources do not provide us with many details regarding the composition of the Tang army that defeated the Eastern Turks, but it must certainly have included a large number of soldiers from the regimental headquarters (fubing). The system of locally based territorial regiments, the mainstay of the Northern Zhou and Sui military, had collapsed together with the Sui dynasty, as various contenders for power “privatized” the units under their command, but the Tang leaders began to reconstruct it in Guanzhong as early as 619 and then extended the system to other regions. This task was nearly complete by the early 630s. The Tang fubing system probably differed very little from the Sui system under Emperor Yang, but far more is known about the workings of the Tang system. The structure rested on several hundred military units of approximately 800 men each, based in designated prefectures and locally recruited. 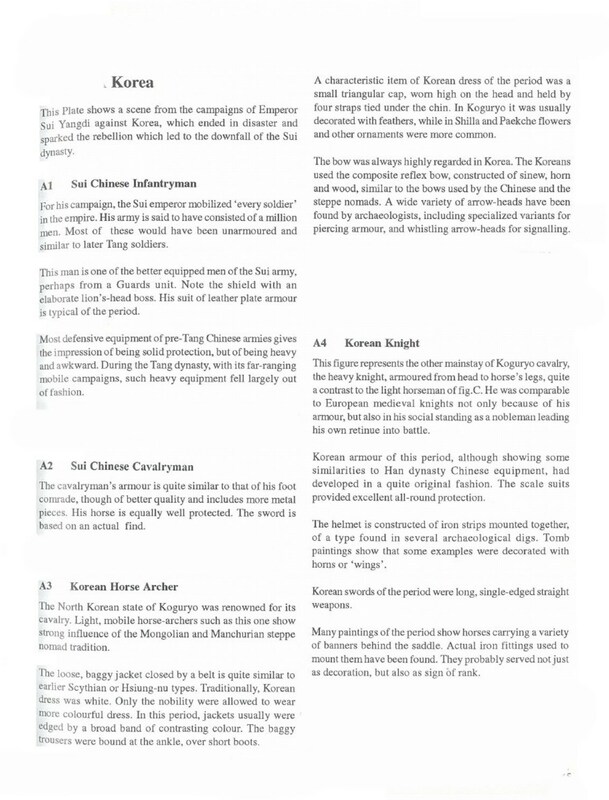 After a great many changes in nomenclature, these units, which had been known as “soaring hawk regimental headquarters” under Emperor Yang, received the lasting designation of “assault-repulsing regimental headquarters” (zhechong fu) in 636, when their commanders became “assault-repulsing colonels” (zhechong duwei). Each regiment was affiliated with one of the twelve imperial guard commands in the capital, where its men were supposed to perform one-month tours of guard duty according to a complex schedule of rotation. The more distant a unit from the capital, the greater the number of shifts into which it was divided and, consequently, the less often each individual soldier’s turn would come up. Regiments within 166 miles of the capital were divided into five shifts, for example, while those between 166 and 333 miles away were formed into seven shifts. The number of “guardsmen” (weishi) present in the capital at any given time may have been in the neighborhood of 50,000. Guardsmen might also be sent to frontier garrisons for periods of up to three years, but this sort of duty was neither as universal nor as systematic as the regular rotational service in Chang’an. When not on guard duty or campaign, the soldiers were expected to support themselves through farming. In exchange for limited exemption from taxes and corvée, they were supposed to furnish all of their own provisions and much of their own equipment. Men were enlisted as fubing at the age of twenty-one and continued to serve until sixty. The local civil authorities selected new soldiers every three years from among the eligible males in the community on the basis of the three criteria of wealth, strength, and number of adult males in the household. The intention was evidently to place the burden of military service on those who could best afford it. However, some prefectures had so many regiments that it would have been impossible for them to meet their quotas had they not been able to induct young men from poor families. Surviving Tang household registers from the northwestern frontier area of Dunhuang indicate that guardsmen from the lowest socioeconomic strata far outnumbered those from better-off families. Nevertheless, service as a fubing must have had some attraction for ambitious men from wealthy families. In addition to the local prestige and status that came from serving the emperor as guardsmen, they also had the opportunity to acquire honorific ranks through their exploits on the battlefield, ranks which entitled them to hold more land than would normally be allotted them by the state under the “equal-field system” of land tenure. Due to the fact that they combined military service with farming, the fubing have sometimes been characterized as a “militia” by Western authors. With its connotations of low quality and ineffectiveness (especially on account of the implied contrast with a “professional” soldiery), this term is rather misleading when used in connection with the fubing. Given their life-long military service and the training they received over that period, it would be more accurate to view them as a special type of professional soldier. Each man is supposed to have been fully equipped with a panoply that included armor, bow and arrows, saber, and lance. He was expected to practice certain martial skills, such as archery, on a daily basis, and every winter, during the agricultural slack season, he would join his comrades for an intensive period of organized drill during which the regimental commander would deploy the men in battlefield formations, hold mock combats, and teach cooperation and coordination by leading them on large-scale hunts. There is little doubt that the fubing were highly effective on the battlefield during the seventh century. The number of fubing regimental headquarters changed over time. The maximum of 633 regiments (approximately 600,000 soldiers) was attained in the early years of the eighth century, when the system was already in decline. A modern authority on the fubing has argued that only 353 regiments had been created by the year 636. The great majority of these were concentrated in areas close to the capital, while vast stretches of central, eastern, and southern China were almost entirely without regimental headquarters. Of the 353 regiments, no less than 261 were located in the Guanzhong region, and many of the remaining 92 were probably situated in nearby areas such as Hedong (modern Shanxi province), the original base of the Tang founder Li Yuan. Of the more than 320 prefectures that made up the Tang empire, more than two-thirds never contained as much as a single regiment of fubing. Those that did, however, were often home to a great many of them. This was especially true in Guanzhong, where the metropolitan prefecture around Chang’an eventually contained 131 regiments and several other nearby prefectures were also very heavily burdened. Even in regions with relatively few regiments, those units tended to be geographically concentrated. All of the regiments in Henan, for example, were located in Luoyang or adjacent prefectures, with none established in the plains to the east. The burden of service was thus very unevenly distributed. Inhabitants of prefectures without regiments were never called upon to serve as fubing, while in some of the more highly militarized prefectures in the northwest it would seem that almost every able-bodied adult male was a soldier. No Tang source provides a clear rationale for this highly imbalanced distribution of fubing. Explanations proposed by modern scholars include the necessity of protecting the approaches to the capital and the need to make sure that enough troops were available within a reasonable distance to provide an adequate pool of manpower to support the system of rotational guard duty. It has also been argued that this pattern was simply a historical legacy of the Tang regime’s origin in the northwest; most of the men of the original Tang armies came from Guanzhong and Hedong, and regimental headquarters were set up in their home communities to accommodate them when they returned from the civil war. Continued adherence to this pattern even decades later, however, suggests that the Tang founders – northwestern aristocrats and the political heirs of Yuwen Tai’s Guanzhong-based regime of the sixth century – simply did not trust the people of the eastern plain. This impression is reinforced by the distribution of the few regiments that were set up in the east and south. 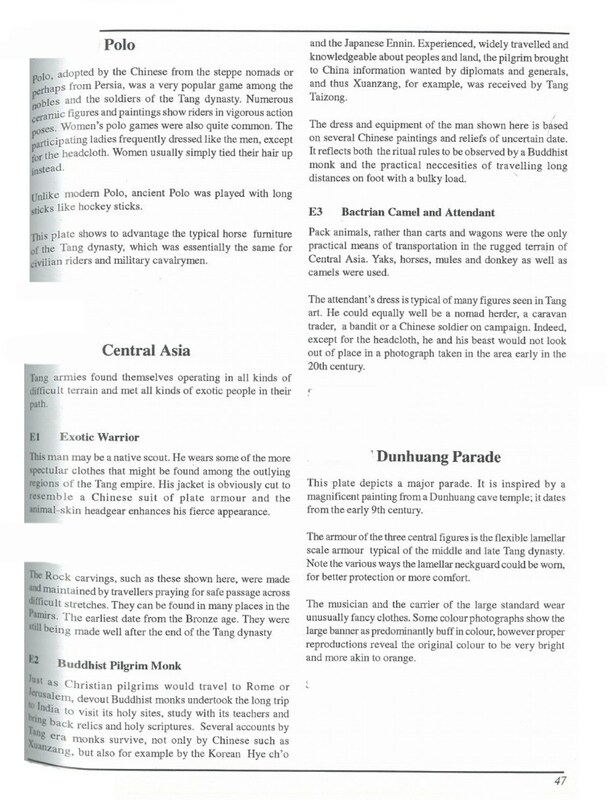 There is a very high correlation between the locations of the regiments and areas that were early centers of support for the Tang cause or served as headquarters for Tang regional commanders during the pacification of the east and south. In other words, these were relatively loyal and reliable forward bases from which the surrounding areas – with no regularly established military units of their own – could be dominated and policed. This would not have been the only respect in which the early Tang military system placed a strong emphasis on control. The mechanism of rotational service itself guaranteed that the generals of the imperial guards would have no opportunity to establish lasting personal ties with the guardsmen passing through the capital on their one-month tours of duty, and therefore would not have the means to pose a threat to the dynasty. Other checks and safeguards were established to insure that the local regiments could not be used against the center by local leaders. The mobilization and deployment of troops from one of the “assault-repulsing regimental headquarters” normally required the dispatch of tallies from the capital. The tally was made of copper, in the shape of a fish, and carried the name of the regiment and its parent guard command. One half was kept by the Credentials Office of the imperial Chancellery, the other was kept by the regimental headquarters. When the tally arrived from the capital it was matched with the local half in the presence of both the regimental commander and the prefect, and only then were troops sent out in accordance with the accompanying imperial order. A commander who moved as few as ten men without permission was subject to one year of penal servitude, while a colonel who mobilized an entire regiment of 1000 men might face death by strangulation. The method of forming campaign armies also worked to prevent generals from turning the troops under their command into personal followers. When the situation demanded, ad hoc “expeditionary armies” (xingjun) were assembled from the local regiments and various other troop sources and placed under the command of generals dispatched from the imperial guard headquarters at Chang’an; once the emergency was over, the troops returned to their prefectures and the generals to the capital. Expeditionary armies ranged in size from about 3000 men to upwards of 100,000, depending upon the anticipated difficulty of their assignments. The largest such forces consisted of several separate columns, each with its own “expeditionary army commander” (xingjun zongguan). One of them would be designated as “expeditionary army commander-in-chief” (xingjun da zongguan) with overall authority to coordinate the operations of his fellows (it was in this capacity that Li Jing was sent against the Eastern Turks in 629). The soldiers of the expeditionary armies were drawn from several sources. The “assault-repulsing regimental headquarters” were one of these sources, but too much use of fubing threatened to disrupt the schedules of rotation and weaken the garrison of the capital. For this reason, the fubing were often supplemented with short-term conscripts. These troops, known as “conscript-recruits” (bingmu), were usually drawn from those prefectures without regimental headquarters, which helped to spread the burden of military service a little more evenly among the population. They represented a far more flexible form of military manpower than the fubing since they could be called up in any numbers desired, often from areas nearest the scene of hostilities, and served only for the duration of the campaign. A third major source of manpower for the expeditionary armies were tribal allies and auxiliaries, including the surrendered Eastern Turks. These warriors served under their own leaders, retained their own form of organization, and were responsible for their own equipment and supplies. They were especially valuable – even essential – in campaigns against other steppe peoples, and accounted for the great majority of some expeditionary armies. In 651, for example, 30,000 Chinese soldiers and 50,000 Uighur tribesmen were mobilized to attack the qaghan of the Western Turks. An invaluable source of information on the functioning of the expeditionary armies and early Tang military practices in general is a treatise written by the great Li Jing himself. It no longer exists as a complete work, but large extracts have survived through their incorporation into the Tong dian (Comprehensive Canons), an encyclopedia of institutional history compiled by the scholar-statesman Du You in the second half of the eighth century. The relevance of this material is not limited to the second quarter of the seventh century, since Li was almost certainly describing many practices that were not new in his own time and continued to be followed long afterward. Part of Li’s work consisted of rather general advice on strategy; here he included many quotes and paraphrases from the military classics of antiquity, and seems to have been operating entirely within the intellectual framework established by Sunzi. For example, great emphasis is placed on determining when the enemy is most vulnerable, in order to be able to choose just the right moment to engage him in a decisive battle. More interesting, because of their uniqueness and the unimpeachable authority of their source, are the passages that provide detailed information on army organization, combat drills, battlefield formations, scouting, signalling, basic tactics, march orders, and camp layouts. According to Li Jing, a typical expeditionary army might consist of 20,000 men, broken down into seven divisions (jun) of between 2600 and 4000 men each. Only about two-thirds of the soldiers in each division – 14,000 for the entire army – are to be used as combat troops, with the balance left behind to guard the army’s camp or baggage train. 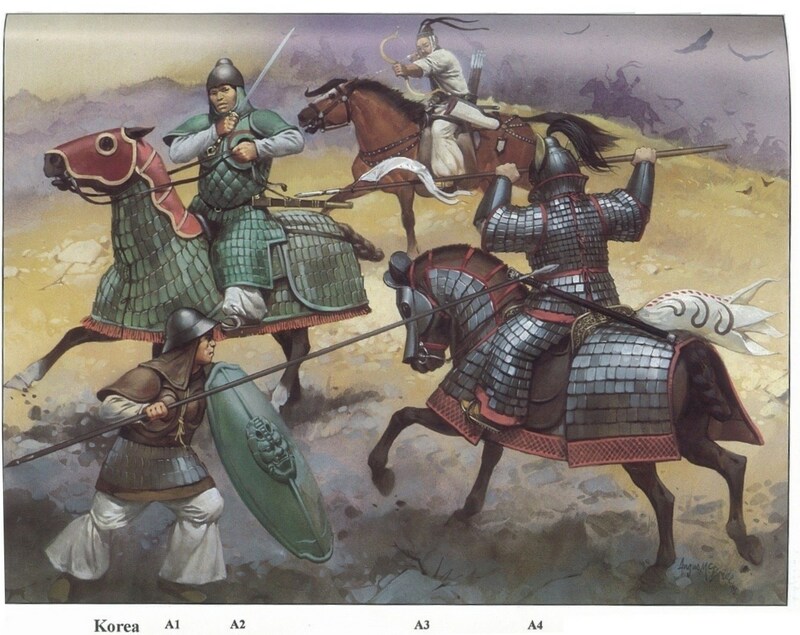 All of the divisions contain the same mix of specialized troops and weapon types, including archers (a total of 2200), crossbowmen (2000), and cavalry (4000). 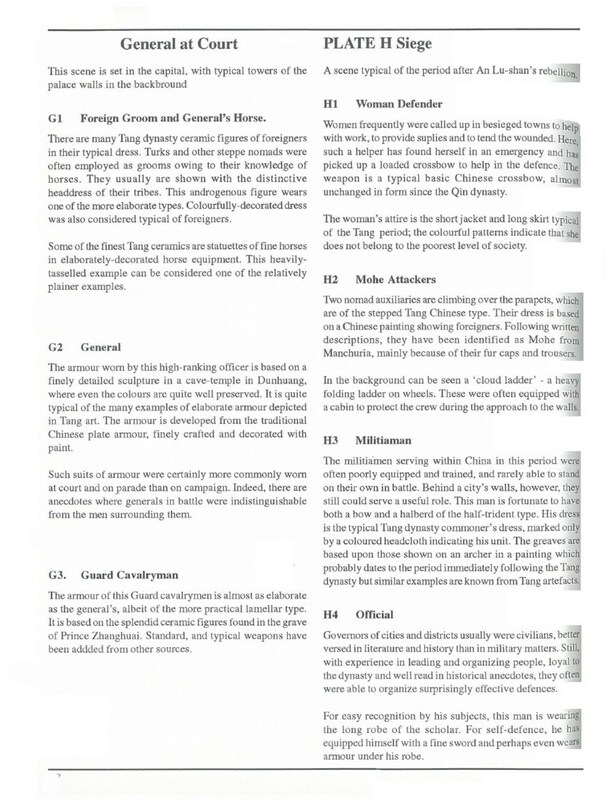 Li Jing’s descriptions of infantry drills suggest that the remainder of the troops are probably supposed to be foot soldiers armed with spears. Perhaps 60 percent of the total force of 20,000 is provided with armor. At the time that Li was writing, the fubing regiments were divided into three to five battalions (tuan) of 200 men, each of which was further subdivided into two companies (lü) of a hundred men, four platoons (dui) of fifty men, and twenty squads (huo) of ten men. 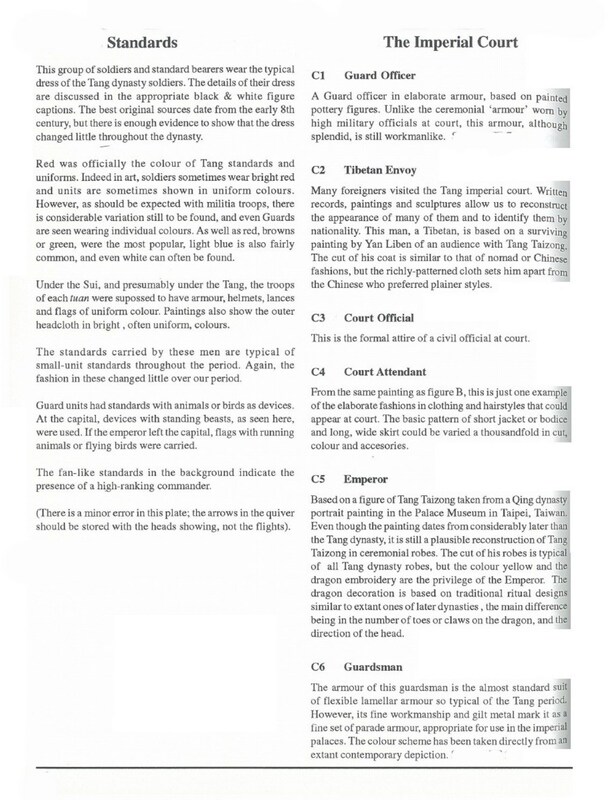 The only one of these units that plays a meaningful tactical role in Li’s treatise is the dui, which suggests that most levels of the fubing organizational hierarchy – including the regiment itself – were used mainly for personnel management rather than battlefield command and control. For Li, the fifty-man platoon is the fundamental, irreducible unit for all deployment and maneuver. It has a full complement of five officers (commander, deputy, standard-bearer, and two-color guards), and it is the smallest unit to be provided with a flag. It has a fixed battle formation five ranks deep in which each man has his assigned place; led by the flag, it is expected to advance, retreat, and maneuver as a body. Though capable of independent manuever, a single dui of infantry was clearly too small to operate effectively by itself. Hence, it was brought together with other dui to create larger formations on the battlefield. While Li Jing’s standard drill formation calls for the deployment of two lines of dui in a loose checkerboard pattern, he also gives instructions for joining varying numbers of dui more tightly together to form larger groupings of 150, 250, 450, and 500 men. Six dui made a 300-man tactical unit called a tong; with one dui told off to guard the baggage, the remaining five could be deployed in several different configurations and assigned different combat roles on an ad hoc basis. When the entire army was deployed in a standard battle formation, the infantry was formed in two lines or echelons of equal strength while the cavalry was positioned to cover the flanks. 65 According to Li Jing, the cavalry were the army’s “eyes and ears” and could also be used to pursue fugitives, exploit openings, and ride down dispersed enemy troops, while the infantry formed the stable core around which the cavalry could maneuver. At the end of the fourth sounding of the horn, the men of all the dui simultaneously draw in their spears and kneel on the ground. Their eyes watch the great yellow standard of the commander-in-chief, their ears listen for the sound of the drum. The yellow flag points forward, and the drum begins to beat; they shout in unison, “Wu-hu! Wu-hu!” and move forward together to the center line . . . When they hear the gong sound, they must stop shouting and fall back, carrying their spears on their shoulders. 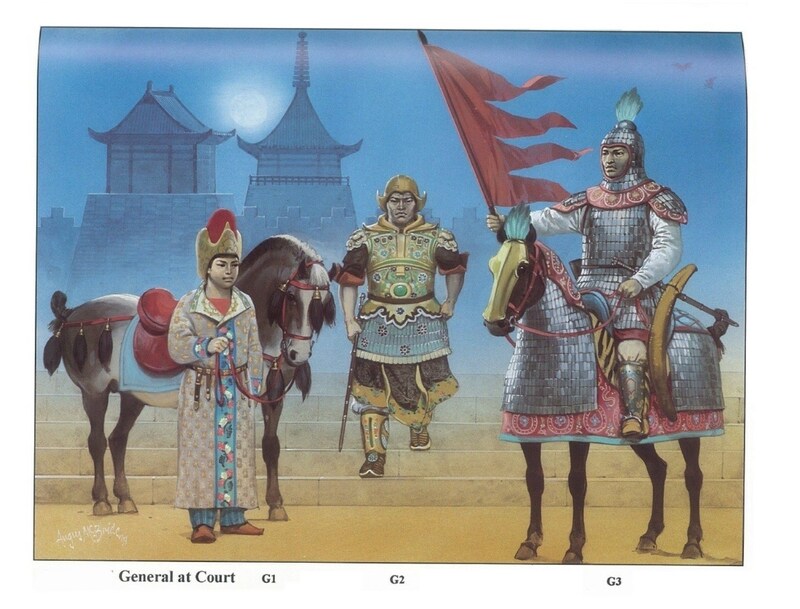 The commander of a Tang expeditionary army was supposed to have five flags, one in the color of each of the five directions, with which he could direct the movements of his troops. When two flags were crossed, for example, the dui were supposed to respond by combining into larger formations. Some sections of Li Jing’s work touch on prohibitions and punishments. These could be extremely harsh, with many offenses punished by decapitation. The soldiers of Tang expeditionary armies were forbidden, on pain of death, from spreading superstitious rumors or bringing women into the army’s camp. A standard bearer who damaged his unit’s morale by failing to hold his flag straight was subject to decapitation, and any soldier who failed to advance when the signal was given was to be killed immediately by the man behind him. The first men to begin plundering after a battle was won also faced execution. This last prohibition dovetails with the concern, repeated many times in Li Jing’s work, that the army never relax its guard and expose itself to surprise, ambush, or sudden counterattack. In battle, troops were often divided into two echelons, with one assigned to attack the enemy while the other was held back to maintain a secure defensive position should the attack go awry. When the enemy retreated in battle, the Tang infantry were allowed to advance only a short distance. Then, if the retreat appeared genuine and not a ruse, the cavalry would be ordered to continue the pursuit. When a Tang expeditionary army was campaigning in hostile territory, mounted scouts were sent out to the front, rear, and both flanks. In each of these directions, there were two men at a distance of five li, two more at ten li, and so on – out to a distance of thirty li (or ten miles). 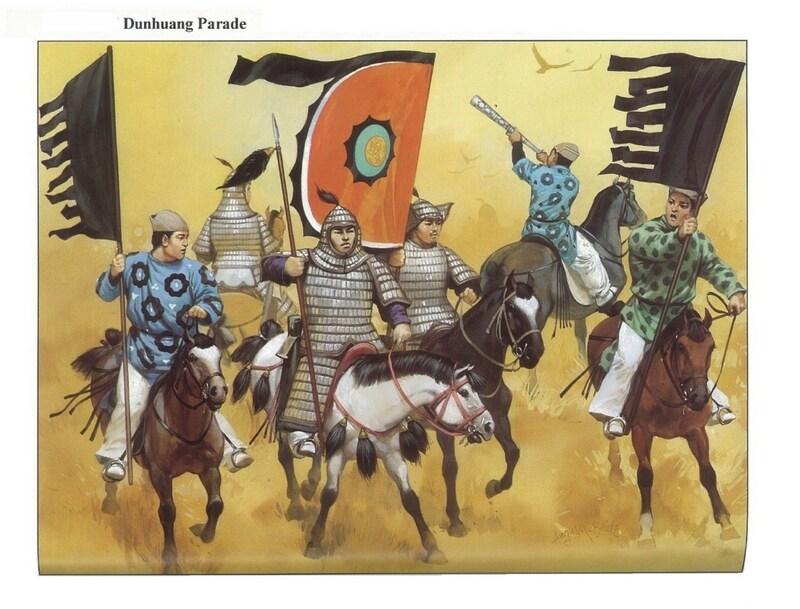 These vedettes were to use flags to signal the approach of the enemy, a method that would have been quite effective in the open grasslands of the north and west where so many of the early Tang expeditionary armies campaigned against a variety of peoples including Turks, Tuyuhun, and Xueyantuo. The contents of Li Jing’s manual are remarkably similar to what we find in Byzantine military treatises such as the Strategikon traditionally attributed to the Emperor Maurice (r. 582-602) and the Tactica of Emperor Leo VI (r. 886- 912). The Strategikon, believed to have been written between 592 and 610, possibly by Maurice or a close associate, is a near contemporary of Li Jing’s military writings. It shows the same concern with battle formations, marching order, camp layouts, scouting, and discipline. Some prescriptions are almost exactly the same. For example, both Li Jing and the author of the Strategikon recommend the execution of soldiers who break ranks to engage in plundering. Also noteworthy is the overall approach to battle. 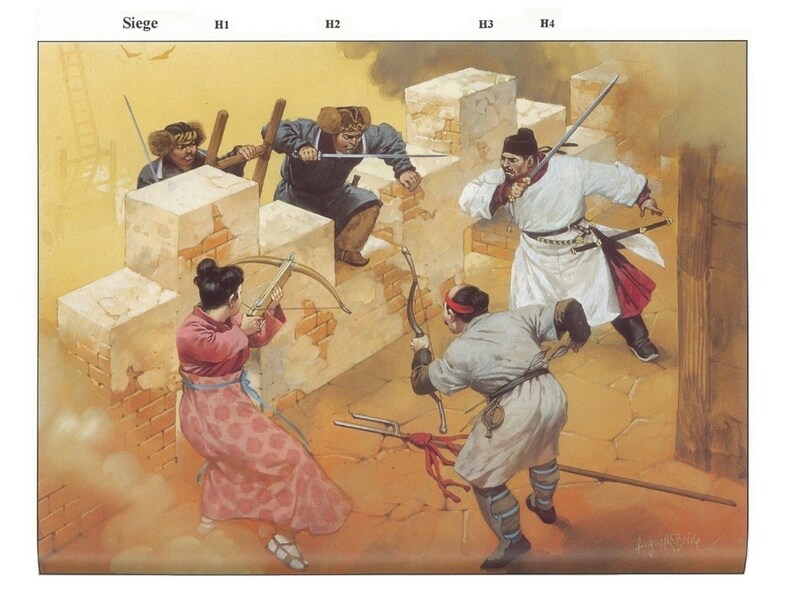 Like Li Jing and his intellectual antecedents, the author of the Strategikon urges caution when deciding whether or not to join battle: “To try simply to overpower the enemy in the open, hand to hand and face to face, even though you might appear to win, is an enterprise which is very risky and can result in serious harm.” Raids, ambushes, and all manner of tricks and stratagems are recommended instead. The Byzantine author of the Strategikon is if anything more cautious than Li Jing, suggesting that battle should be avoided entirely if one’s aims can be accomplished by other means. This entry was posted in Armies, China by MSW. Bookmark the permalink.